​When the joint at the base of the big toe becomes enlarged, this can result in a bunion, or a bone deformity that creates an unnatural bump on the side of the foot where the joint is located. Because of the tightness in the shoe that is created from the presence of the bunion, the big toe eventually becomes misaligned, causing it to be angled in the direction of the other toes. Other toe deformities, such as hammertoe, can also occur as a result of bunions. Because bunions cause constant rubbing of the foot against the shoe, people with this condition tend to experience pain and discomfort. As the bunion grows, it tend to become more and more painful, possibly even resulting in chronic pain that makes it difficult to walk. For some people, bunions eventually become so bad that they can result in bursitis or arthritis. 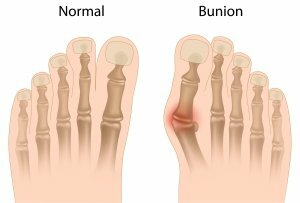 When you have bunions, treatment can help reduce the pain and discomfort caused by your bone deformity, and it can help stop the growth of these bone deformities. The type of treatments you need will depend on how enlarged your joint has become, how misaligned your toe is, and how much pain your bunion is causing you. Here at the office of Eric J. Lullove, P.A. we can identify your specific needs and help you choose the bunion treatments that will be most beneficial for you! Our Coconut Creek podiatrist is highly skilled and able to meet your specific needs. To schedule an appointment with our podiatrist in Coconut Creek, call us at (561) 989-9780!